Gandhi statue defaced: South Africa questioning Gandhi's ideologies? A protesting group donning ANC caps defaced a bronze statue of Mahatma Gandhi standing opposite to African National Congress (ANC)'s Johannesburg office in Gandhi Square, last Sunday. The group of hooligans drove in a dark grey Renault hatchback and came out with tins of white paint, carrying placards that read "Racist Gandhi must fall." The protesters threw white paint on the bust and left. They also defaced a nearby plaque that had detailed information about the contribution made by Gandhi in South Africa. One protester was caught by the police but was released on bail later. This incident happened after the protester brought down the statue of Cecil John Rhodes at the Cape Town University. His statue was removed from campus, after a month long student campaign to banish the white colonialist from the premises. South African students have been involved in endless debates on colonialism, history and heritage in the country. The protest have been an outcome of these month long protest where the younger generation has been questioning about the symbols and monuments reminding of the colonialism and racism, that was prevalent in the nation for hundreds of years. The protest has been widely reported in newspapers and local news channels. The local community laments that the defacing of Gandhi is an outcome of misjudgment. When the group of protesters alleged Gandhi to be a racist, it put him in the company of Rhodes and others who were at a dominant position in the colonial era. 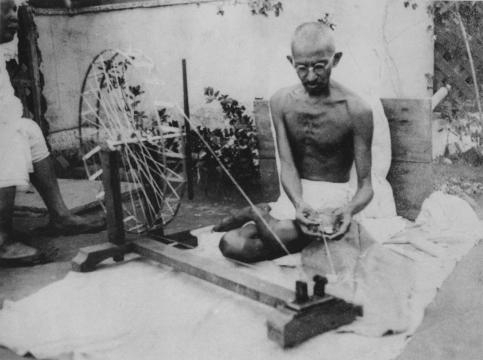 Gandhi, however, marked a new first as this was vandalism of a statue of a non-white person. ANC has been trying to save its face and is evading the embarrassment by dubbing the entire episode as an unfortunate one. In an official statement, ANC have strongly highlighted Gandhi's contributions to South Africa. Gandhi ideology was the major force that inspired Nelson Mandela in shaping the anti-apartheid struggle. Mandela's ANC government came to power in the first complete democratic elections of 1994. The statue depicting Gandhi as a young lawyer in Johannesburg is one of the many statues that the country has. There are several other monuments which have the statues of Gandhi. It may be true that the racist tag on Gandhi has triggered vandalism on his own statue by the protesters. Yet, the whole of South Africa need not made responsible for that while the same need not be questioning the Gandhi's ideologies. Gandhi statues are installed even near the ditches and garbage heaps on the streets of India. They go un-attended, un-maintained and neglected by the very group of people who established it. The same shall not happen to Gandhiji abroad, especially South Africa. The global reception and patronage of Gandhian ideologies must reflect on the place of establishment and maintenance of his statue as well. A wrong place and nonchalant display of support to Gandhiji is very much a disaster of this kind. While the learned and the intellect see Gandhiji at par with other Kings, rulers, scientists and philosophers, the same perception cannot be expected from the laymen and the public. Precaution must be taken at some extra cost.